The Mobile App developers of a leading Phoenix Web Design Company ask its users if they have heard about the recently-gained-popularity apps, the HTML5 Applications. The kind of buzz these apps have picked clues us into that they are probably going to be the face of the mobile application world, this year or probably next. Though we strongly think that this is “one side” of the debate going on and blazing between the HTML5 apps versus native apps and this is what people are listening and seeing for quite a long time. This whole “will-shake-the-landscape-of-mobile-application” tends to make its presence in the limelight every now and then and we reckon that this going to remain as it is for quite some time. Until the whole shell breaks and all the best apps, we’ll witness in future will be the HTML5 apps. It’s highly unusual to see mobile developers carrying out these kinds of debates and the proponents of both the sides going on and about why their version should be considered the best. But when these kinds of discussions actually come out of the developer-zones and straight into the limelight where normal people like us hear them, it actually sends us into frenzy where we can’t seem to decide what to believe. HTML5 in a hybrid form is steadily picking up the pace with mobile developers using this technology like it is being distributed like a cake, we thought it would be nice to devour a part of the cake too and try to understand how the cake is made and how it actually tastes. Let’s first understand what is an HTML5 App? To tell you honestly, I personally, and I think most of you also, might have heard about the “trending” HTML5 apps when once the man who changed the scenario of cellular communication and certainly the fate of Apple Inc. Steve Jobs mentioned that it would be the future of the web and Flash apparently wouldn’t. And up to some extent, his statement saw the day of light when the Cupertino Company blocked access to any kind of Flash Player on iOS. But to be honest it wouldn’t take an eye of a genius to guess that this was coming because HTML without an iota of a doubt has a lot more going for it than Flash ever in its history did. But we are certainly happy about the fact that mobile development has found a good and effective way to code applications. 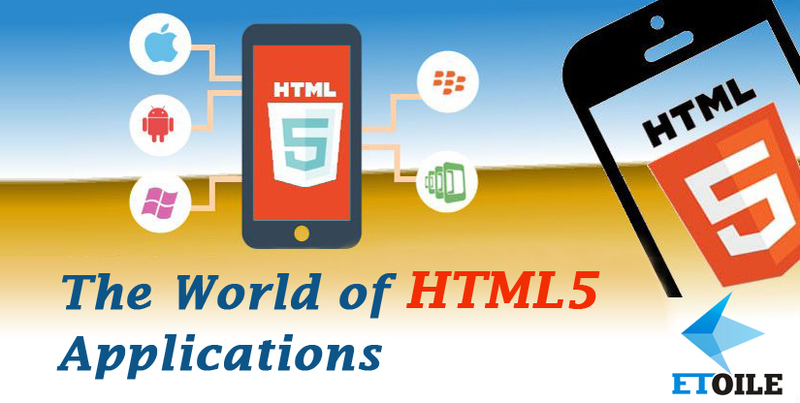 HTML 5 refers to Hypertext Markup Language that we are currently on the 5th version of it. But when you hear about HTML5 apps it means web application developed with the 5th revision of the HTML web content standard and designed and developed for smartphones, tablets and other hand devices. While making HTML5 apps mobile developers are basically dealing with these three codes. HTML is actually providing a framework for the apps where mobile developers can write out their code and an application will transform into something we can use and interact with. CSS is there to provide a way to visualize how all the individual bits of code will work out once they are rendered and is fully displayed on our screens. HTML 5 allows for the development of more complex and easy to install functions than the earlier version of this web standard. This clearly means that the files created through HTML5 will be more like apps than like content. Adding a cherry on the top is the fact that all the mobile devices that are gracing the markets now will be able to support HTML5 apps. This means that developing a mobile application for multiple platforms with a screen that has its own version of that app would be now easier than ever since a code needs to be written only once. This means that the mobile developers only have to write his or her piece of code only once and fine tune it and can put it everywhere. This is quite a relief from having to write separate code for Android, iOS, macOS, Windows, and HTML for webOS and BlackBerry 10. The developers can bring his or her code to life using whatever development environment they choose, be it Notepad or the complex one’s like Visual Studio or Adobe Dreamweaver, debug and fine tune it in whatever web browser they want and will actually work everywhere. Your phone too will be able to support HTML5 apps. We have all seen HTML5 apps being used as a web page. To place the perfect example of this we have micro-networking site like Twitter and Google’s advertising-supported email service Gmail, which clearly presents HTML5 apps at work. Since HTML5 comes with the added advantage that it can be rendered by a web view component, putting a window inside a basic app frame to develop an app you can install directly on your phone is simple and fast. Also to make matters much easier, there are third-party apps available that can do everything for you, like Apache Cordova. This third party tool helps new and amateur developers to bring their new ideas to life and display it to everyone. It also helps seasoned developers to come up with new ideas that we have not seen or heard before. HTML5 dropped in a native application can run the code and make use of the assets it derives from the internet, but a developer has the liberty to install these locally and point the code there for offline native apps. For more information on HTML5 apps, you can contact the expert mobile app developers and coders of a leading Seo Services In Phoenix Arizona, Etoile Info Solutions.